Stuckey's. An oasis in any Southern road trip back in the 60’s and 70’s. Gas, clean bathrooms, and a store full of candy. My brother Gem and I used to search out the window of our family van for the turquoise roofs and bright yellow signs that called out to Mom and Dad for a family pit stop. Stuckey’s was a chain of convenience stores that was founded in Eastman, Georgia by the Stuckey brothers back around 1930. 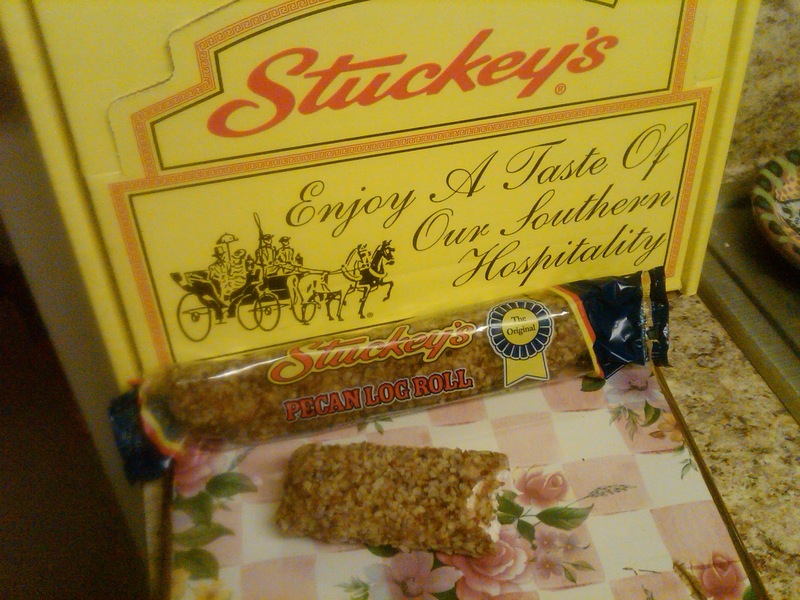 The absolute best thing that Stuckey’s stores offered was the beloved Pecan Log Roll – a confectionery idea that must have floated down to earth from heaven. Part divinity candy, part marshmallow fluffy goodness…all covered in cute little brown pecan pieces. What the name “Pecan Log” lacked in creativity, it offered in honest advertising. My Grandma Frieda once told me that she and her sister (both from Eastman, GA) came up with the name and entered it into a “name this candy” contest; however, I just don’t think that the tale is true. Sadly, sweet Frieda isn’t around anymore for me to interrogate her over it, so let’s just say that my Grandma really did come up with the winning name for the treat! The candy is indeed log shaped, and it serves up the classic tasty Southern pecan nut in sugary sweet goodness. To this day, weary travelers can find a Stuckey’s here and there, especially along Interstate 75 headed down to Florida. It truly is a slice of nostalgia, and in my most recent trip from Atlanta to Ocala, I simply HAD to pull my car off the highway when I saw an exit sign containing a Stuckey’s logo. I was somewhere north of Perry, GA. No gas needed, I just wanted to walk inside and check it out. I steered the white steed (my 2005 Subaru Outback with 170,000 miles on the engine) onto the Stuckey’s lot, parked the car next to the gas pump, and walked in. The store was totally void of customers, and one lonely clerk stood nervously behind the counter as if to say, “what in the Taj Mahal are you doing here?" I said, “Hi! I’m Scout and I haven’t been into a Stuckey’s for a very long time. Thought I’d look around if you don’t mind.” Folks, there was nothing in this store aside from lottery tickets, Coca Cola products, Smokey treats, and racks of Pecan Logs. Behind the candy racks were stacks upon stacks of empty yellow candy boxes that read: Stuckey’s…Enjoy a Taste of Our Southern Hospitality. I guess the proprietor doesn’t like to throw away the boxes. So I grabbed two Pecan Log Rolls, an empty yellow box, and headed to the counter. $5.78 later, I asked the clerk this question: “Hey man, where is Stuckey’s headquartered anyway?” He says…..”Ummmmm, not sure. I THINK in Georgia.” Good man. Sheesh. So that made me a little sad because if the store employee doesn’t know where Stuckey’s is from, then I guess most other people might NEVER find out about it. That’s why I am telling you about Stuckey's. If you see a Stuckey’s logo on one of those exit amenities signs, please go check it out and grab a tasty treat from my childhood. I am unwrapping one of the Pecan Logs that I purchased on my trip right now so that we can share the experience. Here goes….Hmmmm. Mmmmmmm. Not bad! Fresh, buttery, tastes like brown sugar and Georgia sunshine. Here’s to you Grandma Frieda! P.S. How do you pronounce Pecan? Pee-can? Puh-cahn? Pee-kin? gem. your brother. very good. oh. thats me, chickory. in my dog suit. Hi black doggie! Grrrrrhahaha. Yes that would be "Ellis brothers " - Great place! Puleeeeeez, let's make some! Ellis Brothers! thats right. oh the dreaded south 75 trek. I'm a Pe-Cahn, gal. Not sure why. I've been to a few Stuckey's over the years.... usually on long drives and we'd be so happy to see the Stuckey's sign... it meant... good food! 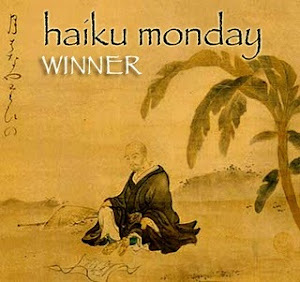 I'm hostin the next Haiku Monday and I really hope you're in. The theme is RAIN. Boxer, i am with you - peCahn is how I say it too! A lot of the mountain folk up here say it pee-kin which always makes me smile! Your haiku theme is fitting for my life as it has been raining so much around hear. 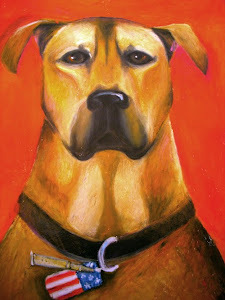 I will be walking tag this morning, and I will start pondering on what I want to write! Have a lovely day and thanks for memory of stuckey's! I have made that I-75 trek on many occasions when I lived in Orlando! Pe-cahn or puh-cahn. Jes' never pee-can. I know this long stretch--an' din't we onc't discuss the New Perry Inn? Well, last time I'se on I-75 jes' after dinner time, the Perry Inn be closed an' sent us'uns somewhar' to the WEST 0f 75 to a BBQ place that were terrific! Alas, no pe-cahn rolls thar'. I ain't never stopped at Ellis Brothers, but I will now. Puh-cahn in Co. I lived with my grandparents a while growing up and they traveled like gypsies. Gramps worked for the Geological survey. When ever I went in to a Stuckeys It seemed like a vast sea of food and doo-dads. There were booths in some. I haven't seen one for twenty years at least. Hi peeps! I got an email from my Mama! Here's what she says about it all....She don't know how to comment here I guess> Nonetheless precious. To Curmy: Doo-dads - INDEED! Perfect word for "Southern Stuff". Thank you for the baby protector pictures (pitchers) - are they not all adorable? Just think about how the Amazing Lord has blessed us with furry best friends who only want to love us? Thank you God for our dogs. Amen. P.S. Curmy - protector is a Chickory Original. Ain't that something?